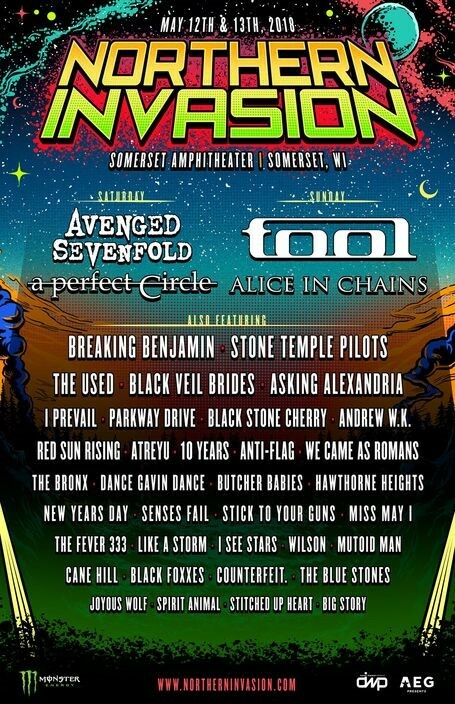 One of the largest rock fests in the Upper Midwest should remain a big deal next year when Northern Invasion returns May 12-13 to Somerset Amphitheater with two of Maynard James Keenan’s three bands, Tool and A Perfect Circle, along with Avenged Sevenfold, Alice in Chains, Breaking Benjamin, Atreyu, the Used and the newly reborn Stone Temple Pilots. The festival's 2018 lineup was announced on Monday morning along with a statement from Keenan, who made it sound like at least A Perfect Circle will finally drop a new album in time for the festival in Somerset, Wis., just about an hour from Minneapolis. Both Tool and APC performed at Xcel Energy Center this past year, but neither one has put out a record in more than a decade. Keenan pulled a similar twofer stunt at the River's Edge Festival on Harriet Island in St. Paul in 2013, when both Tool and his third band, Puscifer, performed. This time, APC will open for Avenged Sevenfold on Night 1 of the Invasion, Saturday, May 12, and then Keenan will return with Tool a night later with Alice in Chains for its opener. Tool, Avenged Sevenfold, A Perfect Circle, Alice In Chains, Breaking Benjamin, Stone Temple Pilots, the Used, Black Veil Brides, Asking Alexandria, I Prevail, Parkway Drive, Black Stone Cherry, Red Sun Rising, Andrew W.K., Atreyu, Anti-Flag, 10 Years, We Came As Romans, The Bronx, Dance Gavin Dance, Butcher Babies, Hawthorne Heights, New Years Day, Senses Fail, Stick To Your Guns, Miss May I, Like A Storm, The Fever 333, I See Stars, Wilson, Mutoid Man, Cane Hill, Black Foxxes, Counterfeit., The Blue Stones, Joyous Wolf, Spirit Animal, Stitched Up Heart and Big Story. Full weekend passes for the fest are on sale now via NorthernInvasion.com and are priced $200 for a two-day VIP pass and $100 for general-admission, with a four-pack g.a. package also on sale for $319. Prices will increase over the coming months. Campsites for the weekend are sold separately. Northern Invasion is produced by concert giant AEG Live and is part of a chain of hard-rock fests around the country that also includes Rock on the Range and Rocklahoma.